I always find midi and maxi rather classy, but it wasn't until recently that I started incorporating these pieces into my wardrobe. Being 5'2", I used to think that anything passed my knee would make me look even shorter. There are many different types of midi and maxi style out there, the trick is to find the right kind. If you have a smaller frame like myself, style with a more tailored and tighter fit would help elongate your figure. You can of course wear flowy pieces too, just make sure it's on the lighter side, anything too bulky or heavy would look like it's weighing you down. Lastly, complete the outfit with a pair of wedges or heels to get that extra height. Thrifted vintage leopard print cardigan. 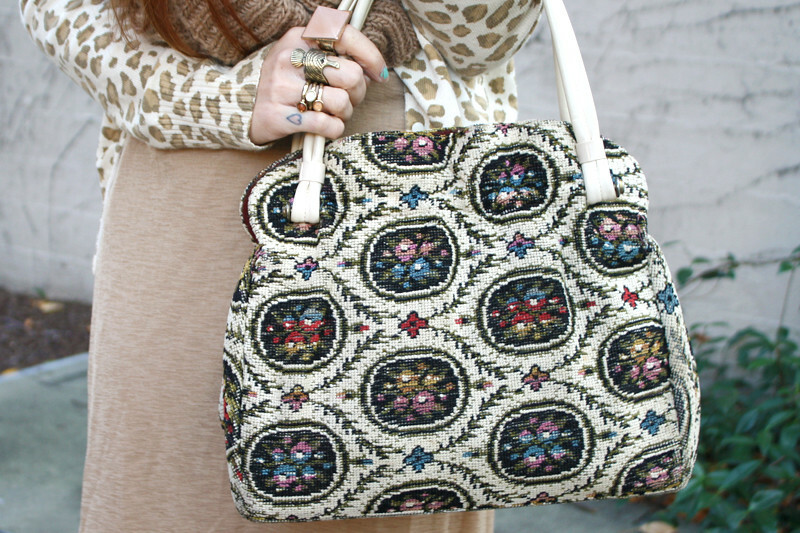 Tapestry handbag from Rust Belt Threads. Knit circle scarf from H&M. Suede booties by Qupid.Rings from F21 and my work Sway. I love when people dont let their appearance or their height influence what they wear too much. I think maxi and midi lengths are flattering for all body types and you're right about wearing hells, too. Of course. I like the light colors and I love your cardigan and bad especially. You always look lovely and your photos are great. I like your long dress and your look is beautitful.. Kiss.